Happy Saturday! Apparently this weekend is Easter? I'm so off of a normal schedule I have no idea what's going on anymore lol. But today I have another review of recent plates to show you. This time from Bundle Monster and the new Secret Garden Collection. 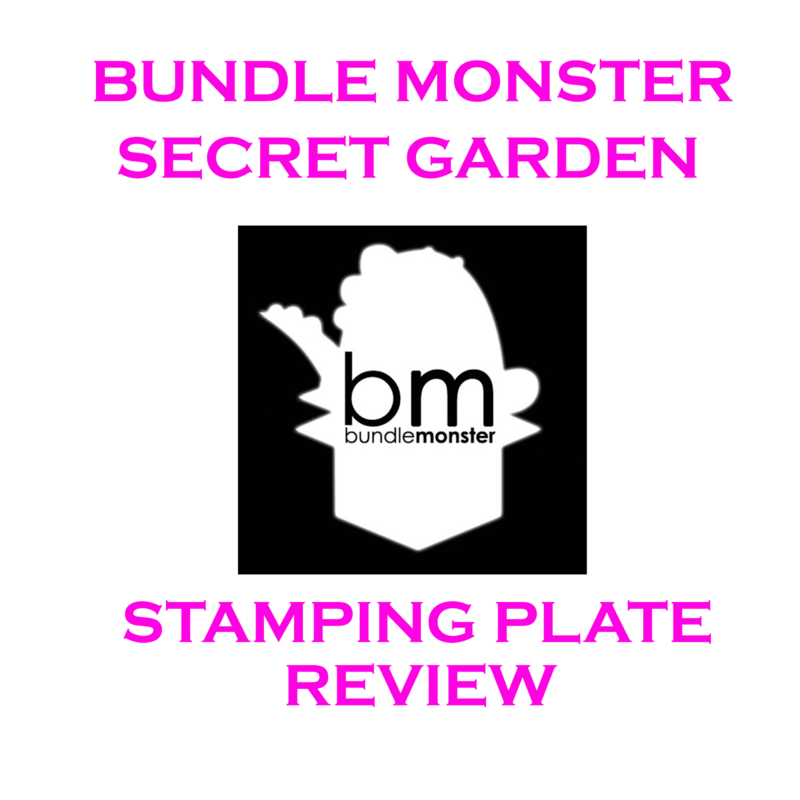 Honestly its been a very long time since I posted a Bundle Monster review, years in fact, though I do have all their plates except one collection and some of the new rectangular plates. Generally speaking since I'm blessed I've had a friend give me the last set and I didn't feel a need to rush to swatch though generally speaking its a good idea to do so when you first purchase these plates so that if there's a problem you can do an exchange within the time limit. Bundle Monster and Amazon (where I often purchase) both have wonderful exchange and return policies as I've posted about before. Now let's get started and don't forget to leave feedback or questions if you have them! The Hawaiian stamping plate powerhouse that needs no introduction if you are at all familiar with the nail art stamping world. Having produced 7 collection to date not including their latest XL sized plates with images from prior collection Bundle Monster is no slouch when it comes to stamping plate production. They generally offer a nice blend of affordable plates and nail art products with responsive coverage. More recently I have fallen in love with their storage option for rectangular plates which you can read about here. Today I'll be focusing on their first foray into the "buffet style" stamping plate style. There's really no need to compare image sizes since this is a "buffet/infinity" style set any size nails should be able to be accommodated depending on the size of your stamper. If you are interested in comparing the sizes of other plates you can take a look at my chart for that here. As with all my reviews when swatching out the images I used Wet N' Wild Black Creme and my gold standard XL marshmallow stamper from Magno Nails. I used this one because the images here are tough to pick up on with smaller pads i.e. 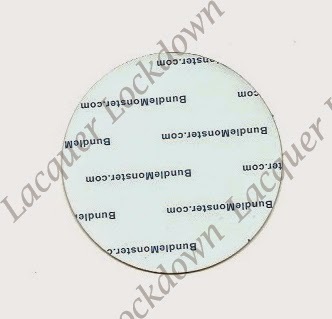 less of the image is picked up due to the smaller diameter of the standard XL pad. 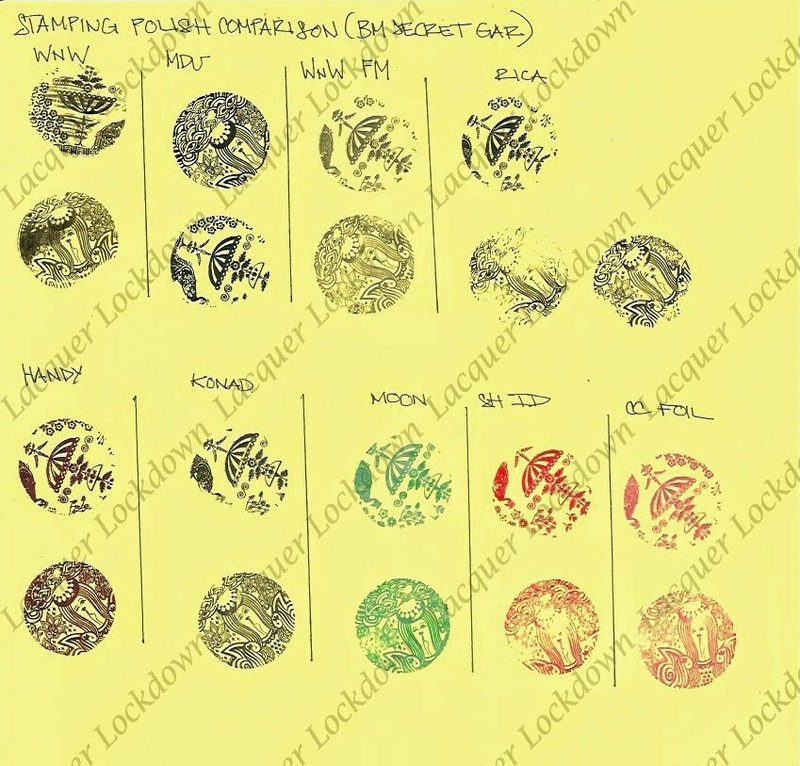 In the case of difficulty with picking up an image switch to Konad Special Stamping polish or Mundo de Unas as you will see annotated below. For the most part these plates were excellent though there were a few that I struggled with even using the best stamper I owned for pick up and Mundo de Unas, which in my opinion, is one of the best polishes a person can stamp with. This is why ultimately its really very important to swatch out your plates when you get them so that if you have a problem you can get the faulty plates replaced. In this section I demonstrate how well or poorly a plate will stamp depending on the type of stamping polish used. The truth is I own a lot of different brands of polishes across a host of color ranges. You don't have to, but this section is mostly for those who don't have such a wide access to different polishes as I do. You will also find regular polishes used here that IMO also stamp very well. I think you will be able to see from the swatches that the quality of the stamp does vary quite a bit with these plates depending on what polish you use. The more opaque polishes tended to produce the best image. The plates used here are BM 708 and BM712. So overall I think the bargain of getting these sets from Bundle Monster is first class! You get a lot of images when you consider the price point of other individual plates on the market and they are priced more competitively than other buffet style sets. For me this collection was a dance between loving some images and finding others a bit stale and repetitive. Lately I have seen so many plates on the market with flowers, flowers, vines, and more flowers. What's great is if you don't own them then they can be a wonderful addition to your collection, but if you already have a lot you find yourself kind of wishing for more from a design perspective. That's a bit how I feel here. 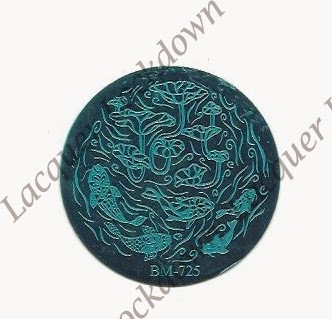 Also for whatever reason a few of the images were so small, some of the flowers as you can see in the swatches, that when stamped did not translate over well. They just looked a bit jumbled for lack of a better word.